I have a Tioga Class C. I'm a first time RV owner and hope to travel the Southwest this summer with my family. A friend of mine took it out for a ride and knocked off the top of a vent above the refrigerator. Rain got in for a night (light rain) and I have no idea if it caused any damage. I don't even know what this vent is for? Can you please shed some light? Until I get a replacement, I've covered the hole with plastic and tape. Would appreciate any help. Harry, do not operate the refrigerator with that vent opening blocked off! It is vital that the refrigerator have a clear and open chimney from the lower door on the side of the RV behind the refrigerator, all the way up the back of the cooling unit and out through the roof opening. If you operate the refrigerator in this condition you will quite likely melt that plastic and start a fire and possibly do damage to the cooling unit. Heat transfer and heat build-up must exit through that opening. If anything, it is much better to operate the refrigerator with just the hole in the roof than to block the opening completely. 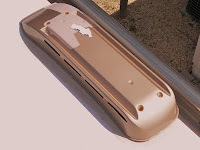 Replacement refrigerator roof vents are readily available at any RV supply store and can be easily installed by any RV handyman. Use plenty of putty tape or Eternabond tape under the flange of the vent base and secure it to the roof with screws sheet metal screws. Add a layer of Eternabond tape over the screw heads and all will be fine. But until then, use an ice chest.